Ah Twitter, we thought we knew you. A comprehensive survey (1,753 respondents) released by Edison Research (a division of Arbitron), paints a fascinating picture of Twitter and its role in America's social media ecosystem. Like Terrell Owens, Carrie Underwood, and Coke Zero, Twitter is almost universally on the radar of Americans. 87% of respondents had heard of Twitter, compared to 88% who had heard of Facebook. (Note that the survey population was 12 and up, including a representative portion of seniors). Thus, we can safely assume that with the exception of Amish, prisoners, and sea creatures, the entirety of the country knows about Twitter. Known by 87%, just 7% of Americans use Twitter. Thus, fewer than one in 13 Americans who know about Twitter, actually use Twitter. Compare that ratio to Facebook, where 88% have heard of it, and 41% have a profile (a conversion rate approaching 50%). While only 7% of Americans are using it, the Twitter population is still 17 million people, which is roughly equivalent to the combined populations of Connecticut, Oregon, Kentucky, Kansas, and Oklahoma. And while substantially smaller than the Facebook brigade, the Twitter crew is tuned in to brands like nowhere else on the social WEb. 49% of monthly Twitter users follow brands or companies, compared to just 16% of social network users overall. 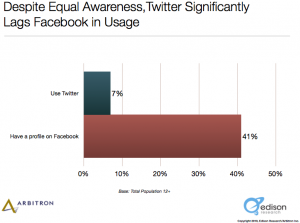 Put another way, Twitter users are 3 times more likely to follow brands than Facebook users. Combined with their above average income and above average education, Twitter users' propensity to interact with brands make them a huge potential source for Mass Influencers (although Forrester's research says Facebook is a better pool). In addition to following brands, Twitter users research and engage with companies. 42% learn about products and services via Twitter. 41% provide opinions about products/services. 19% seek customer support. "Twitter users talking about marketing and brands far exceeds the usage on the other social networks," said Tom Webster, the VP of Strategy & Marketing at Edison (and the study author), when I interviewed him for this post. I maintain that as Facebook continues to tie together the real-time Web with the open graph, Twitter usage will inexorably shift from person to person connectivity, to customer to company connectivity. I believe Twitter will ultimately be the way that we interact with brands, and will power the social CRM movement. Tom agrees, and included that concept in the Executive Summary. Forrester's Tamara Barber recently published a report showing Hispanic usage of Facebook and other social networks far outpacing usage by non-Hispanic White Americans. 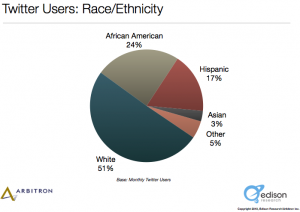 This Edison Research shows that for Black Americans, the social network of choice may very well be Twitter, as 25% of Twitter users are African Americans (approximately double the U.S. population). Tom Webster theorizes this may be due to Twitter's functional similarity to text messaging, as several studies have shown Black Americans use the mobile Web at rates roughly double that to non-Hispanic Whites. Certainly, the tie between Twitter and mobile is strong, as 63% of Twitter users access social networks via mobile phone, compared to 34% of social networkers as a whole. Also, 73% of Twitter users send SMS text messages multiple times per day. Also, 49% of Twitter users have an iPod, compared to 28% of the total U.S. population. Makes me think we should be doing more podcast promotion on Twitter? Maybe I just don't get it, but I don't really see the point of Twitter if you're not engaged and interacting. But according to these findings, 53% of Twitter users never post any updates. To me, this reemphasize the needs to be keyword smart in your Tweets, and to not dip into the pool of banality. Even though half your customers may not be tweeting or retweeting, they ARE watching, reading, and clicking. What's most surprising to you about Twitter in America?